Are you a follower of Haiku By Ku? Kuruk is an Alaskan Malamute like me. He writes haiku! Oh Ku, can I dig too? And, also like me, he lives with kitties! 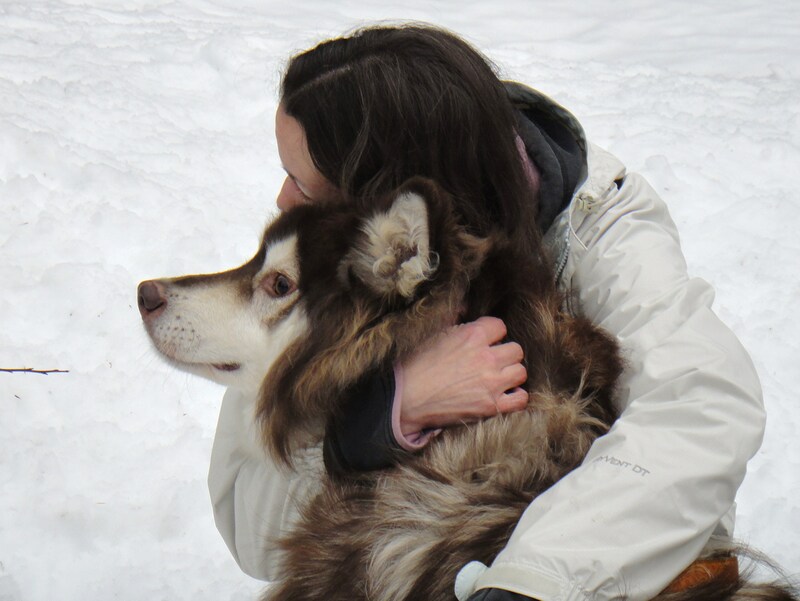 Ku was rescued in 2011 as a part of a puppy mill bust in Alaska, and he traveled 3000 miles to be with his mama. He and his mama wrote a book about the experience. 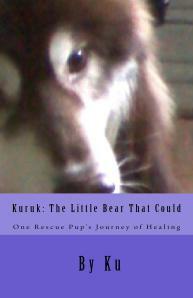 It’s called, Kuruk: The Little Bear That Could. It’s sad in that we learn the effects of living on the end of a chain in a puppy mill environment had on Kuruk. It’s happy in that we see the positive transformation that love facilitated in Ku. And your purchase of the book helps animal rescue efforts. Kuruk and his mama, who gave him love and a forever home! Now if you’re an Amazon Prime member, you can borrow the book for free as a part of their library program. So why not check out this book! You can share some love with a fellow blogger, and enjoy a good read in the process! I love Ku! And their blog! I have ordered the book already, just have to finish my current series before I start it. I’m glad to hear that Ku was rescued by lovely mama and lives with her happily! That book seems to be very interesting, so I have to check it out! Thank you Rumpy. I am so glad Ku was saved from that horrible place. I will definitely check out this book. And how very kind of you to tell about the free borrowing from Amazon Prime You are so good! Please say hi to Jen and the Kitties. I hope you have a great week ahead! 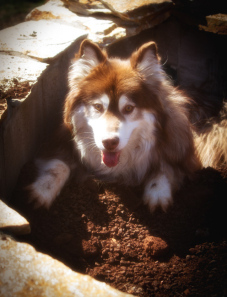 So fun seeing two of my favorite malamutes on the same blog together. Mum has read the book and loved it!! We love Ku and his book! We won it from another blog a while back and wrote a review of it too. He has a great story! I am so happy that Kuruk has his forever home. He is so adorable! That books osunds liek a wonderful book. Although it has a happy ending, we bet it’s heart rending in parts. Oh my he has longer fur then you Rumpy 🙂 GORGEOUS. Have you got our parcel yet? Please support Ku and his Momma! Their book profits go to rescue and tell a great story! Thanks Rumpy for posting about him. You are both wonderful members of the blogging world!!!! !